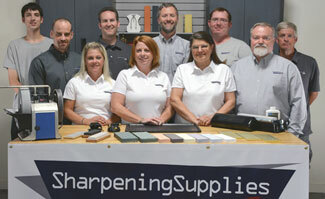 In order to understand sharpening, it is helpful to visualize dull and sharp edges. By understanding what dull and sharp look like, it is easier to understand the process of getting from one to the other. Unfortunately, edges tend to be rather small and hard to photograph. So to make things easier, we’ve made some larger-than-life models of edges in various states of sharpness. The flat surfaces that come together to form the edge are called bevels. The two bevels here are smooth and their intersection is a crisp line, forming an even edge that runs the length of the blade. In this model, the bevels are 20 degrees on each side of the blade. 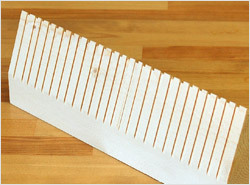 This means the total angle of the edge is 40 degrees, which is common for knives. Other angles are used for other edges, but a 20 degree knife edge is a handy illustration, and the concepts remain the same for all edges. Here you can see that the two bevels are smooth as far as they go, their intersection is no longer crisp. Instead they come together in a rounded and blunt edge. This sample is exaggerated to make it easier to see what’s happening. A real edge that looked like this would not slice anything, and loss of cutting ability would be noticed long before things got this dull. The intersection of the bevels is not continuous for the whole length. This is a good illustration of what an edge can look like after it has been used for a while. Many people believe that an edge with a few nicks in it is still good, however on closer inspection it becomes apparent that while portions are relatively sharp, the areas that have been damaged are not. This edge may still cut, but not as well as a sharp one. To be truly sharp, it needs some work. 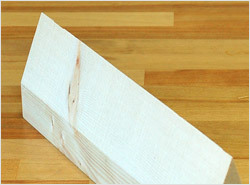 In order to sharpen a dull edge, material must be removed from the bevels until they once again meet in a crisp line. 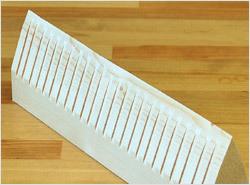 This model shows the dull edge and the material that must be removed in order to sharpen it. Here we have sliced the waste off. In actual sharpening, abrasion instead of slicing is the usual method of material removal, but this shows the idea. In this model, removal of the waste material leaves an edge that is closer to sharp, but the bevels are still not intersecting. Instead, there is a flat portion between them. More material will have to be removed until they truly intersect to form a sharp edge, but this is on the right path. 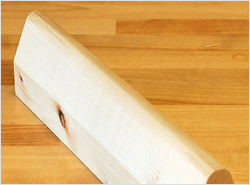 Sharpening stones are used to abrade away the waste material. Initially, aggressive coarse grits are used to get the bevels into shape as quickly as possible. This process leaves deep grooves cut into the bevels. The bevels on this example are intersecting, but because they are not smooth the edge they form is not a crisp line. This is the start of an edge that will cut, but the peaks and valleys are weak spots and it is not truly sharp yet. Once the coarsely sharpened stage has been reached, progressively finer grits are used to smooth the bevels. Each new grit is used to remove the scratches left by the previous grit, and the process continues until the intersection is again a crisp line the length of the blade. 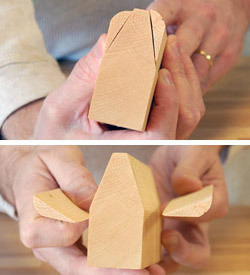 The process can be applied to the entire bevel, or as in the model shown here, just to the part nearest the edge. After the coarsely sharpened stage, it is sometimes possible to increase the sharpening angle by a degree or two and apply the finer grits to only a portion of the bevels. Called a micro bevel, this technique saves time and wear on the stones as the finer grits are not being used over as large a surface area as they would be if entire bevel were to be smoothed. 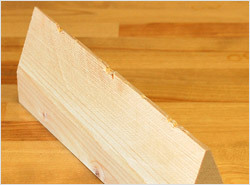 Questions about what makes a good edge?